Like so many cities, Memphis, Tennessee, is imagining the future of one of its largest natural assets, its waterfront. The Home of the Blues marks the approximate midpoint of the Mississippi River, and until recently, it has mainly utilized it for industrial purposes, like many other American waterfront cities. While the river has been home to casino riverboats, and a riverfront park does exist, plans are now underway to turn the area into a full-fledged cultural destination. Memphis-based archimania, in collab­oration with Peter Chermayeff and BWS&C have put forward a plan called the Mud Is­land River Park + Cultural Center, which aims to bring the public closer to the wa­ter and provide educational opportuni­ties. 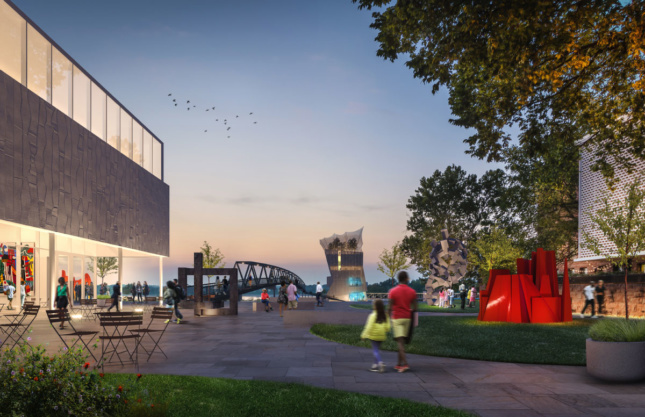 The scheme calls for cultural facilities linked by a pedestrian path that would also connect Mud Island (a peninsula edging the city and the river) and the city’s riverfront to the adjacent redeveloped Fourth Bluff Civ­ic Commons. The centerpiece of the project is the Aquarium Museum, a complex on Mud Is­land that will show off aquatic species and focus on the city’s long history with the river as well as contemporary water studies. On the other side of the river, the complex will likely include a reimagined Memphis Brooks Museum of Art. The Brooks is currently lo­cated outside of the downtown area. The past few years have seen a number of proposals for Memphis’s downtown and waterfront, with an eye on the city’s bicen­tennial in 2019. Just northeast of the pro­posed Mud Island project, a building and development moratorium for the downtown Pinch District is being reassessed through a planning and architecture study led by the Division of Housing and Community Devel­opment and the Memphis office of Looney Ricks Kiss. Chicago-based Studio Gang Ar­chitects have also produced a Riverfront study for the city, which was released in mid-2017. 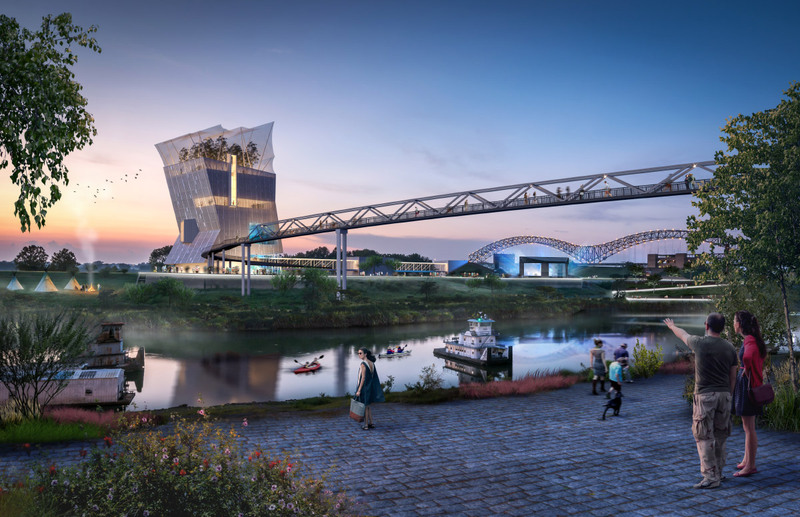 The Mud Island proposal was in­formed by the Studio Gang research, which called for any projects along the river to fos­ter, restore, and connect the city, the river, and the larger ecology of the area. Considering the numerous proposals, it is likely that we will see multiple develop­ments and amenities coming to Memphis’s extensive riverfront in the coming years. To get the wheel turning, fundraising is set to begin for the Mud Island River Park + Cul­tural Center in 2018, with construction start­ing within the next four years.